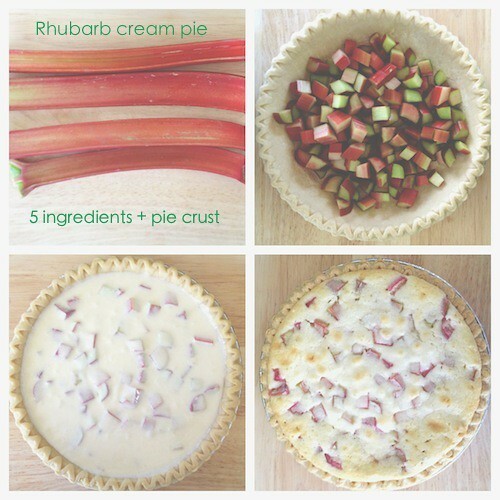 A few years ago-almost to the day-I shared a family recipe for rhubarb cream pie which is as good as it sounds for us rhubarb lovers. (You can make this pie with pretty much any berry. I’m using some leftover frozen blueberries in this recipe later this week.) This pie has 5 ingredients plus the pie crust. For a homemade pie crust recipe visit this link because I went all store-bought on you this time (organic, someone-made-it pie crust). Rhubarb and nothing else spring-like is happening in Minnesota. We’re under yet anther winter advisory that could bring 6 to 10 more inches of snow and it’s April 22. So imagine my surprise when I spotted it at our local co-op Friday. I believe I squealed and made a beeline for it. 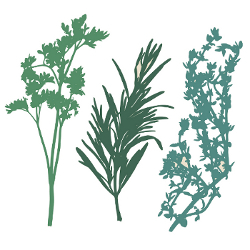 While walking around the store, I kept imagining what I would make with the 4 stalks I picked up. The only thing I wanted most was this pie. As Greg went to check out, I ran to the back of the store and picked up an organic pie crust (to make it even easier) and some heavy cream. Little more than flour, sugar, and cream with some chopped rhubarb make this pie happen. A little chopping, mixing and pouring (if you have a pie crust already) and in an hour (plus some time to chill or let it come to room temperature) this unattractive yet delicious pie will come into being. Not much of a looker until you taste its magnificence then it is the prettiest little pie you’ve ever eaten. Between the two of us, we ate every bit in 2 days. Which brings me to the point that I tweaked the recipe a smidge. If you use the full 2 1/2 cups of rhubarb plus the other filling ingredients it could make your pie overflow. Just slightly less than 1 cup of heavy cream is my recommendation if you are going with the full amount of rhubarb. Also, it doesn’t need a cup of sugar-3/4 cup worked well to keep even more of that tartness which is optimal for me. My original recipe gave it an hour for baking at 350F but I have a better stove these days that told me I was baking at 340F for about 50 minutes when this baby was ready to come out. If you do go for 350F, keep an eye on your pie crust. Those edges will burn and you might have to bring in some foil to protect it. I still say this pie is best chilled for a bit in the fridge then brought out for a few minutes at room temperature. Chilling is not necessary but definitely let it cool. Preheat the oven to 340F or 350F (my preference is 340F). Fill unbaked pie crust with chopped rhubarb. In a large bowl, combine flour, sugar, cornstarch and cream. 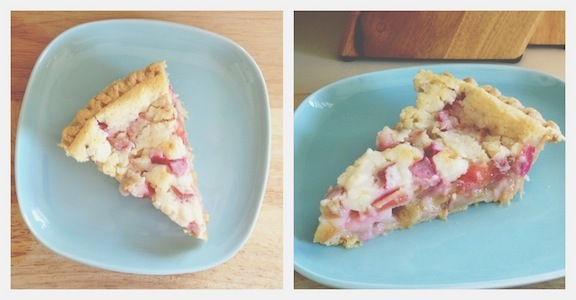 Mix well and pour over the rhubarb in the crust. Place the pie on a baking sheet just in case and bake for about an hour (mine at 340F was 50 minutes but past apartment ovens took the full hour at 350F), until the center of the pie still jiggles slightly and the crust is golden. You might have to cover your pie crust with foil halfway through or later at 350F because the edge will burn before your pie is ready to come out so keep an eye on the crust. Let the pie cool or my favorite for this pie, chill it in the fridge for about an hour then dive in. Love this! It’s the simplicity of the recipe that really lets the rhubarb flavor shine through. Thanks for sharing! I love rhubarb pie! this filling looks incredible! Thank you so much, Alanna! Enjoy! Thanks for coming by, Rosie!